June | 2011 | Crappy Kitchen - Good Dinners! I brought this bread over to my friends’ house the other night. Soda-based breads are the kind I grew up with, and Lyle’s syrups were a staple on the shelves of Irish supermarkets. 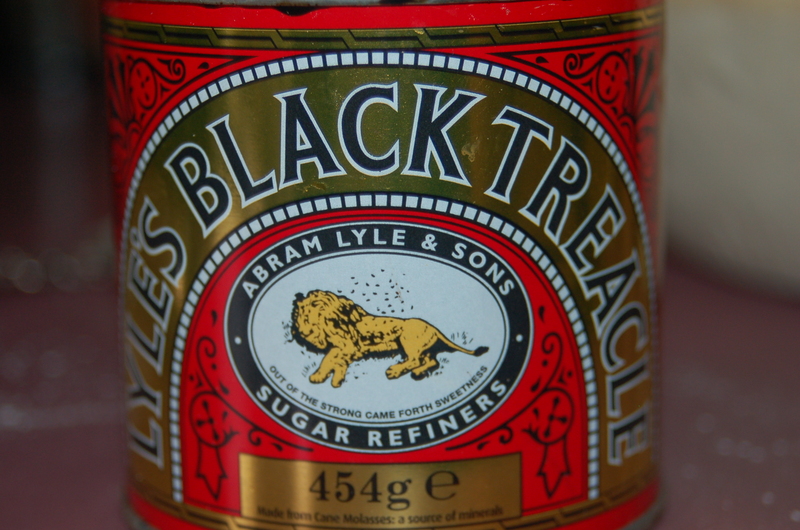 Lyle’s Black Treacle still comes in a gold and black tin with a lion in the center. It boasts uses such as a sweetener for cakes and breads, and even a glaze for salmon! I have only ever used it in spice-type cakes or breads. I have to admit, the thought of spreading it on salmon doesn’t really appeal to me. 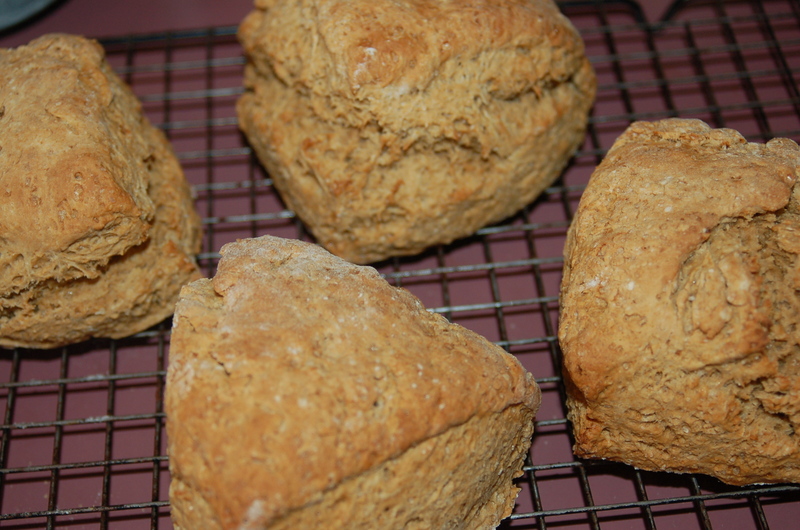 This quick bread is completely changed by the addition of treacle and ginger powder. It is great if you are not a cereal person, or it’s the middle of the day, and you have a longing for a cup of coffee or tea with a little smackeral of something. You will need: 4 cup all-purpose flour, 1 tsp baking soda, 1/2 tsp salt, 1/2 tsp ground ginger, 4 tbs raw brown sugar, 4 tbs unsalted butter, 2 tbs treacle (or dark molasses if treacle is unget-able! 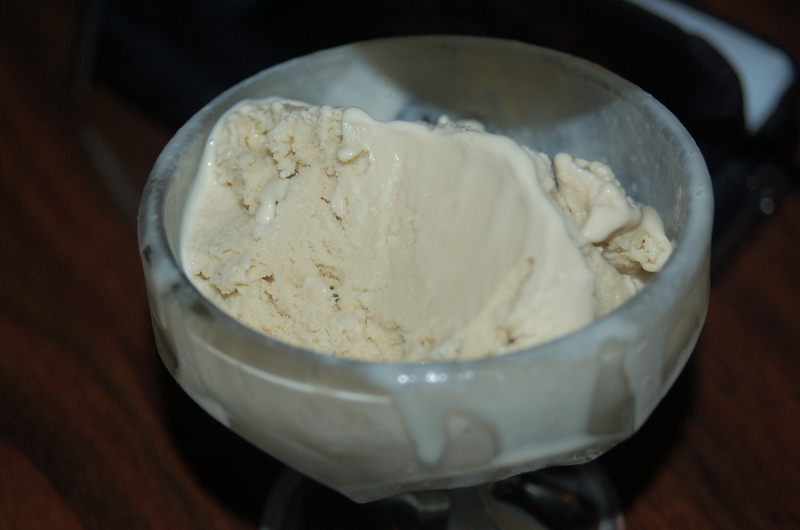 ), 1 1/2 cups low-fat buttermilk. 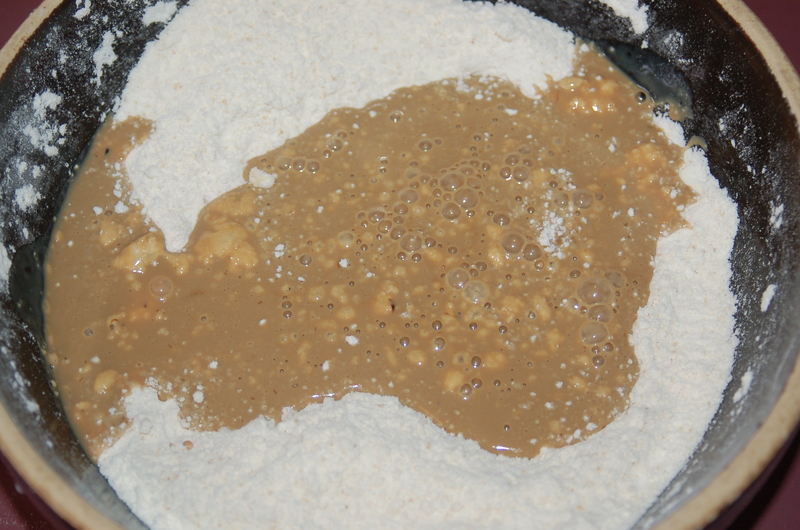 1 – In big bowl, mix the flour, salt, ginger, and sugar. 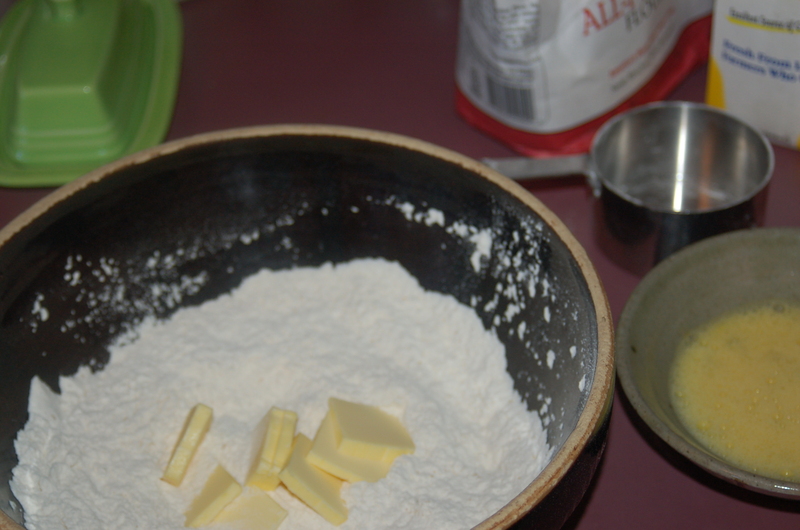 Using your fingertips, add the butter and rub into the flour until it resembles a fine meal. 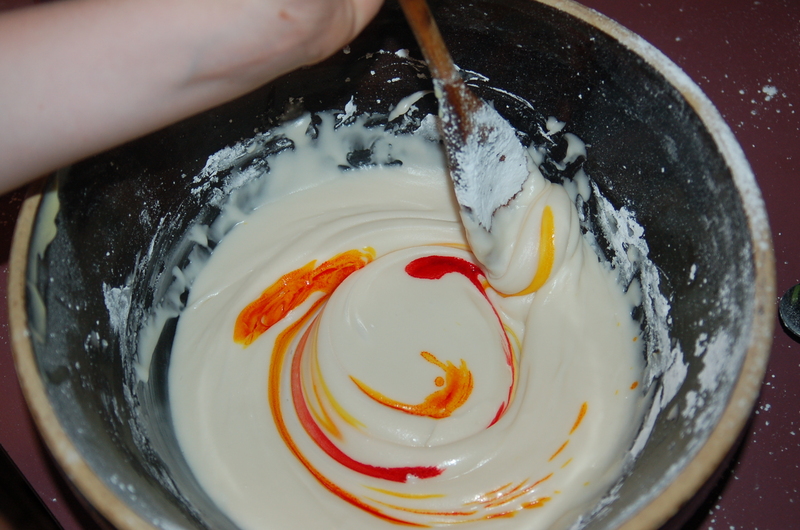 In a bowl, whisk the buttermilk with the treacle using a fork, and add to the flour mixture. 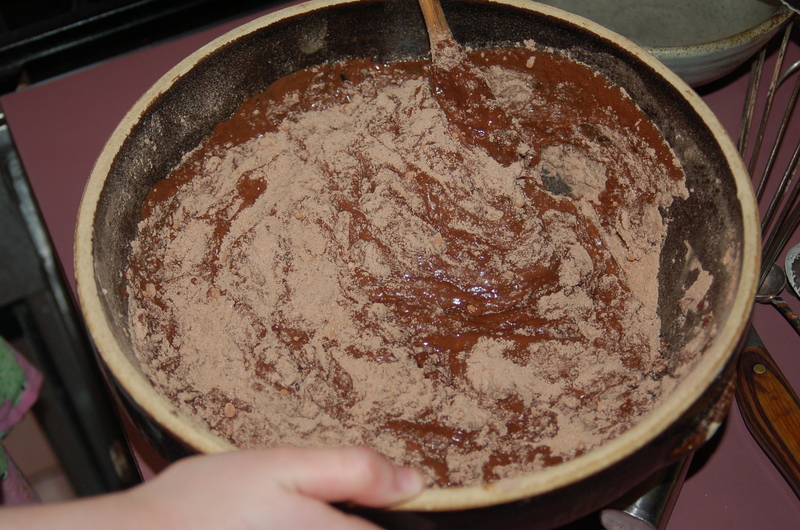 2 – In a bowl, whisk the buttermilk with the treacle using a fork, and add to the flour mixture. 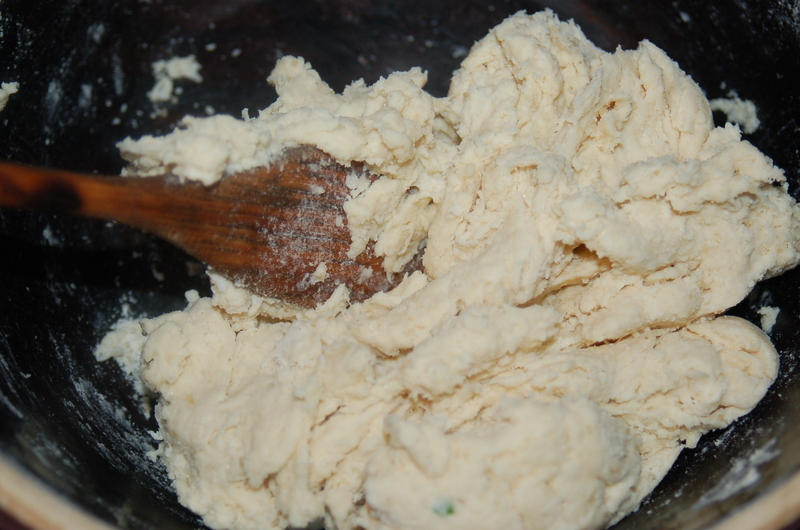 Mix with a wooden spoon until it becomes one ball of dough (about 1 minute should do it). Turn out onto a lightly floured board and knead into a ball and flatten into a 7″ disk. 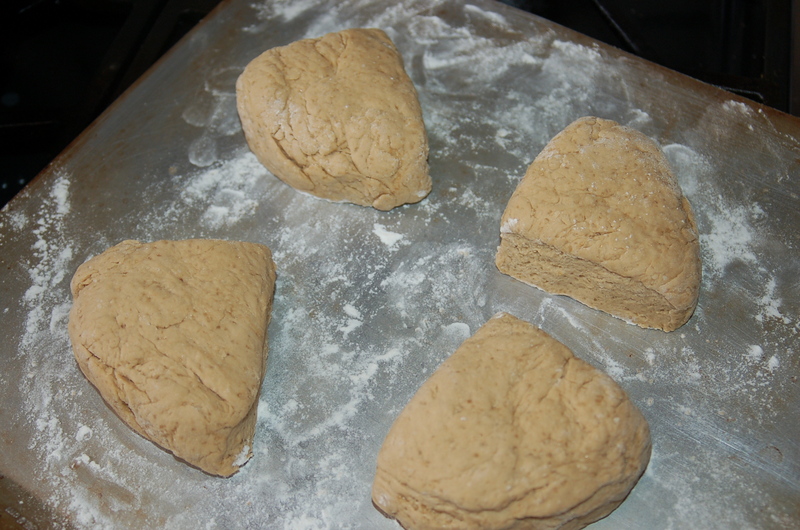 Cut in 4 pieces, and place on floured baking sheet. Bake for 25 minutes or until it sounds hollow when tapped. Cool on wire rack until warm. Slice and eat with butter and jam, or whatever else you fancy. Can be stored in a plastic bag in the fridge for up to 4 days and eaten cold or toasted. Eat warm with butter and jam..
Last night I had dinner with friends (and strangers!) so I didn’t have to cook dinner. I did however have to make lunch, and I decided to make something that could work for either dinner or lunch. It was good, so good in fact, I was sorry I didn’t make it for dinner when people were coming over! Isn’t that always the way? One can go to tons of trouble to prepare dinner when company is coming, and, on days when there is no pressure whatsoever, you invariably come up with a winning dish! Such was the case yesterday afternoon. All of a sudden the kids were clammering for food, and I lied as I usually do, and said they would be eating in “12 minutes or less!” I put a pot of water on for pasta and told myself that by the time it was ready, there would be something in a pan to receive it. I raced down the back steps to my little plot of dirt, and decided on a bunch of flat-leaf parsley, and sweet basil leaves. All I envisioned was chopping them so finely they would turn everything a brilliant green. I was so excited about the resulting bowl of food that I stood by my kids and wanted to know immediately what they thought. They barely got a mouthful down before I attacked them for a critique. My daughter declared it was the best pasta dish I had ever made, and my son nodding in agreement, too busy eating to speak. 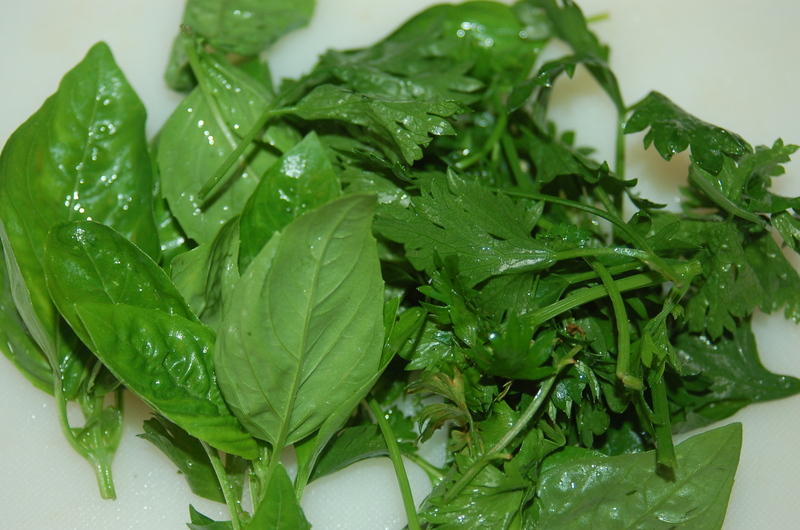 Of course hunger can do terrible things to one’s judgment, but I have to say, if you can get your hands on some fresh herbs, and you want something ultra-fast, this is the thing to make. It would also be great if a hoard of people descended upon you, and they are in need of feeding! 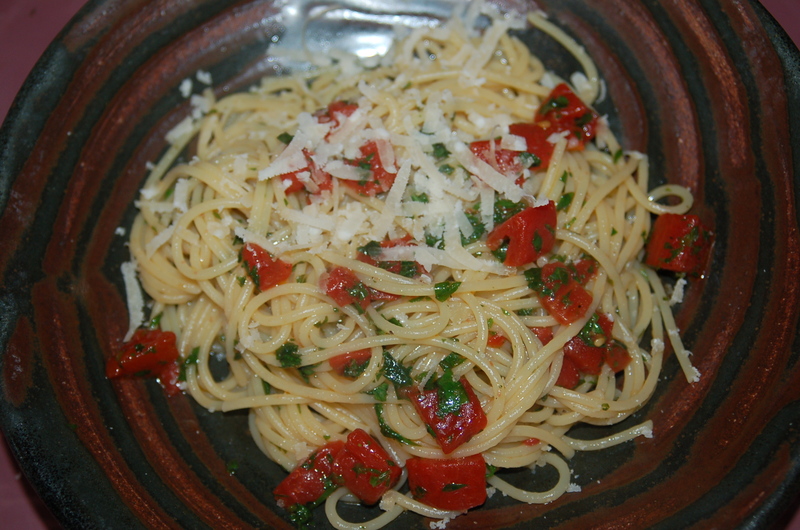 You will Need: 1/4 cup plus 1 tbs extra-virgin olive oil, 1 bunch of Basil and 1 bunch of flat-leaf parsley, chopped ultra-fine (chopped, should measure a 1/2 cup in total), 1 big garlic clove, thickly sliced, 3 plum tomatoes, skinned, pulp removed and diced (I used 3 plum tomatoes from a can, so the prep was quick and easy), 3/4 lb spaghetti pasta (I use Barilla brand), coarse sea-salt (I use Maldon slat flakes) and freshly ground black pepper, Parmigiano Reggiano for sprinkling over finished dish. 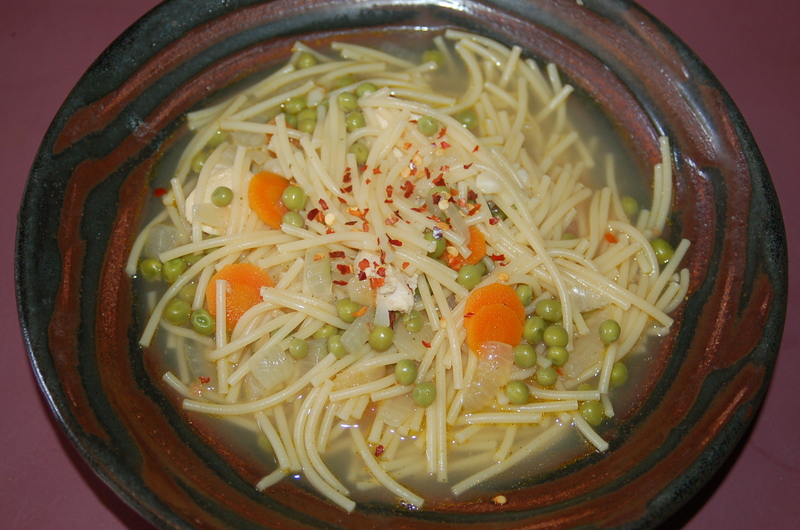 1 – Put pot of water on to boil for spaghetti. When it boils add a tsp of salt and cook spaghetti according to instructions (generally 8-9 minutes). Prep vegetables, but, do not start step 2 until the pasta has 6 minutes left to cook. 2 – Put big saute pan on medium heat and add oil. When it warms up, add the sliced garlic. Cook on both sides until beginning to turn brown. 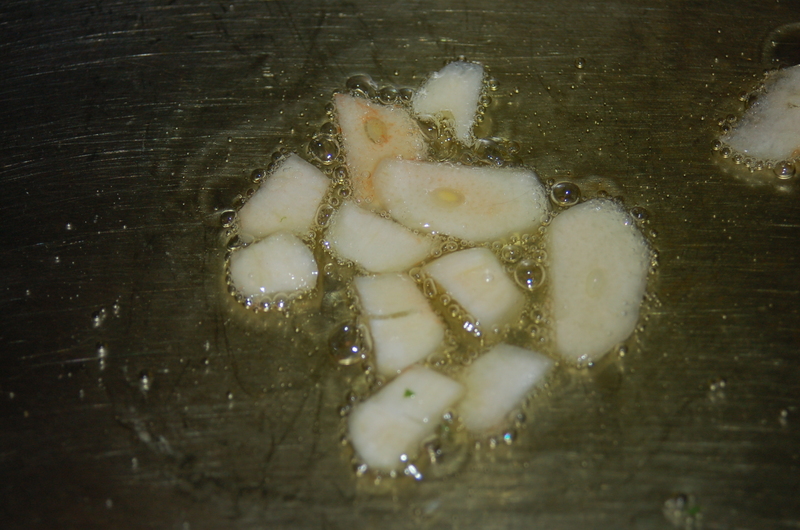 Remove garlic and discard. 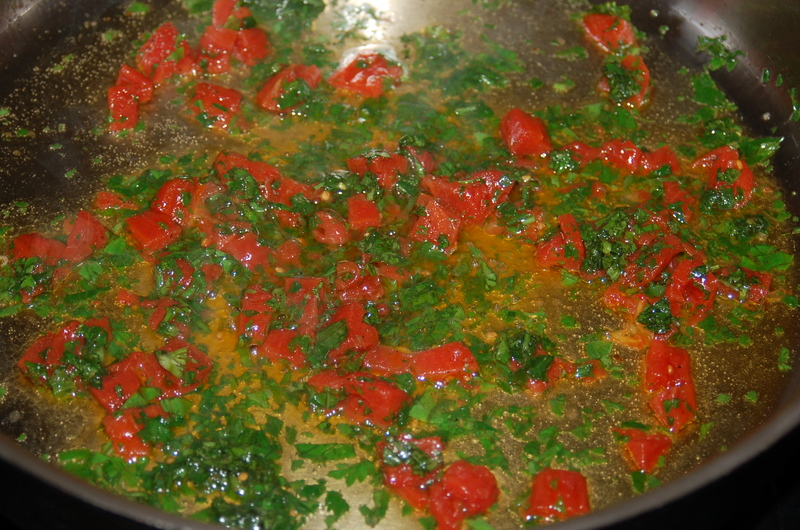 3 – Add tomatoes and cook for about 1 minute before adding the fresh herbs. Cook for further 3 minutes, stirring occasionally. Add a little coarse salt (1/4 tsp) and several grinds of pepper. 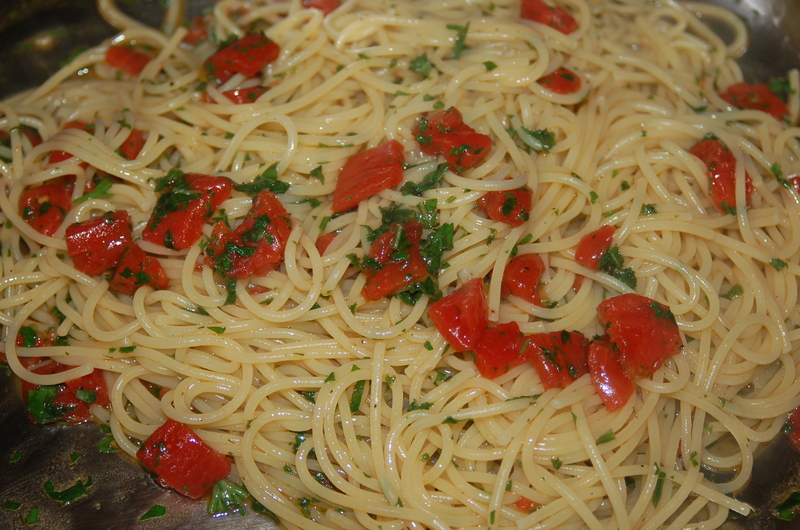 4 – Turn off heat and toss drained pasta into pan and incorporate. 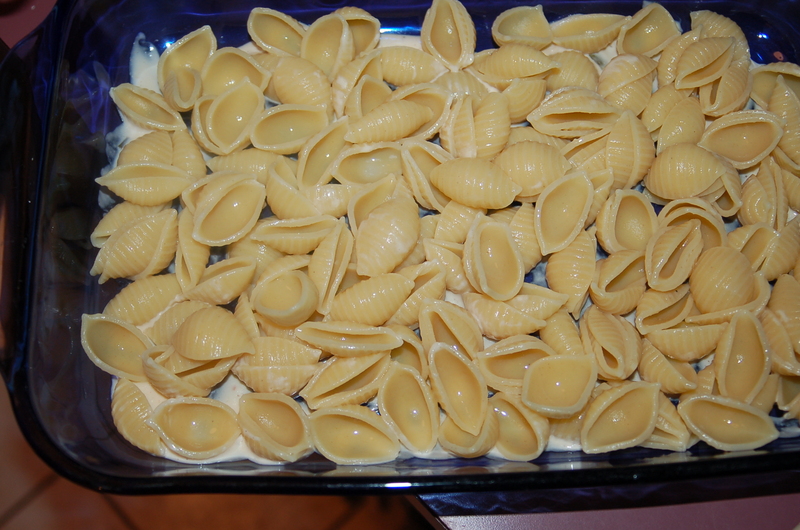 Serve in warm bowls with a little cheese if you like. I also cooked a few seasoned sausages on the side, for the meat lovers. So, you are in a hurry and dinner time is descending fast; what to cook? Dinners like the one below have gotten me out of countless spots of desperation. 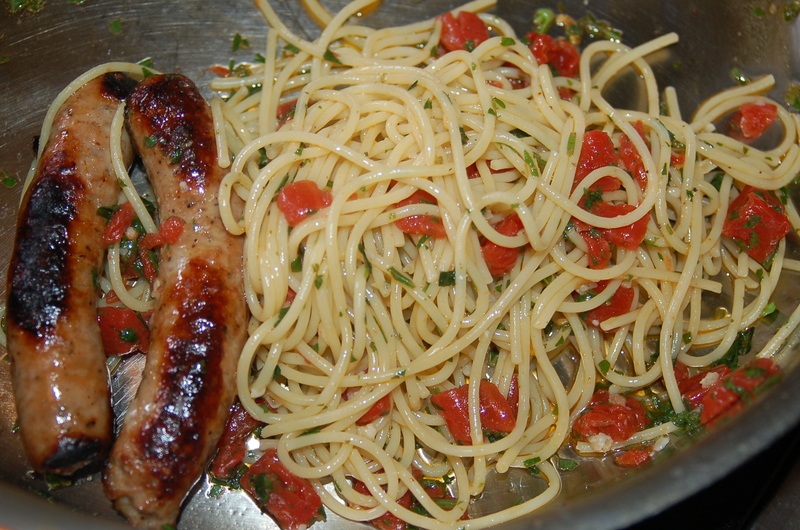 My advice is to always have pasta in the cupboard, along with some meat in the freezer, and you can’t go wrong (it doesn’t hurt if it is summertime, and there is an abundance of herbs growing in a pot, or the dirt outside your back door either!). This can be changed any way you like, depending on what you have on hand. Don’t be afraid to experiment. If you stick loosely to the method, it should be delicious! You will need: 2 boneless chicken breasts, sliced in half lengthways and cut into bite-sized pieces, 2 tbs extra-virgin olive oil, 1 medium sweet onion, diced, 2 garlic cloves, roughly chopped, 1/2 tsp chili flakes (1 tsp if you want to feel a smidge of heat), 1 carrot, thinly sliced, 1 cup frozen baby peas, 12 lemon basil leaves, left whole, 1 bouillon cube, 8 cups water, coarse sea salt, freshly ground black pepper, 3/4 lb box spaghetti. 1 – Put big pan on low/medium heat and add the oil. When it warms up add the onions and garlic and saute for 5 minutes. Add the carrots and chili flakes and continue to cook for another 7 minutes. 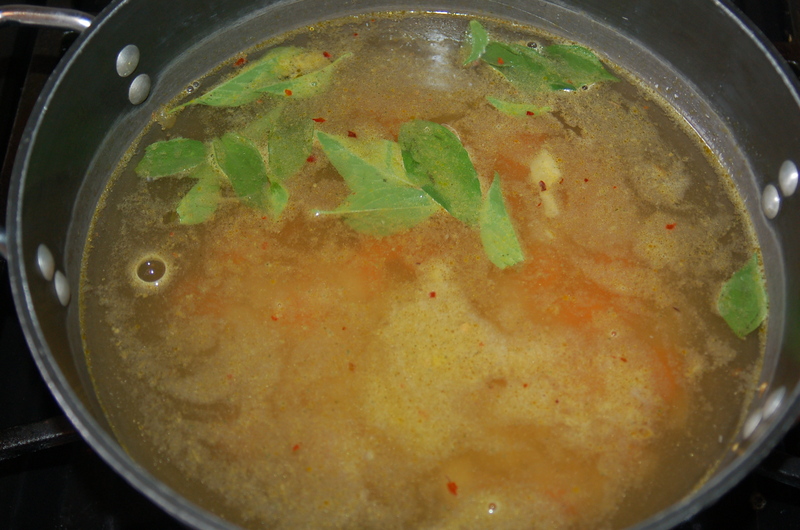 2 – Add the stock cube and water and bring to a simmer. Add the lemon basil and peas and bring back to a simmer. Add the chopped chicken, lime juice and break the spaghetti strands into small pieces (I was able to break a strand 6 times) and add to the liquid. Add 1 tsp coarse sea salt and several grinds of pepper. Stir to separate the strands and bring to a very gently simmer. Cook for about 9 minutes. 3 – Take off heat and taste. Add salt and or pepper as desired. Partially cover for 5 to 10 minutes. This gives everything a chance to settle. That’s it – so quick, dead easy, and tasty! I would certainly give this dinner a big thumbs up! I pulled a cut-up chicken from the freezer in the morning, and didn’t think much about what to do with it until one of the kids asked what great culinary delight was in store for them (not his exact words mind you)? 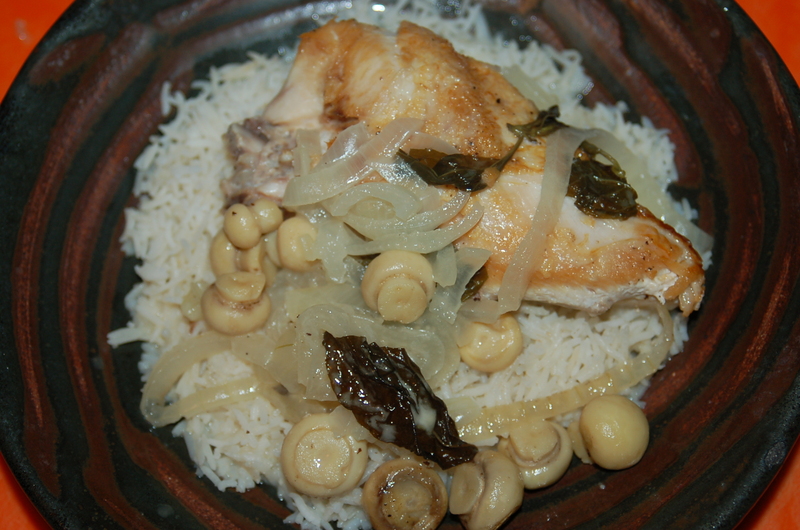 I was in the mood to please, so I tried to think of something really impressive, “Chicken, infused with a gingery broth, sweetened with basil leaves form the garden, served with aged basmati rice!” With words like that, my children were expecting something very grand indeed! When it came time to cook dinner I got a late start due to one thing or another. I asked if we could put the chicken thing off until tomorrow and make something fast (like a sandwich? 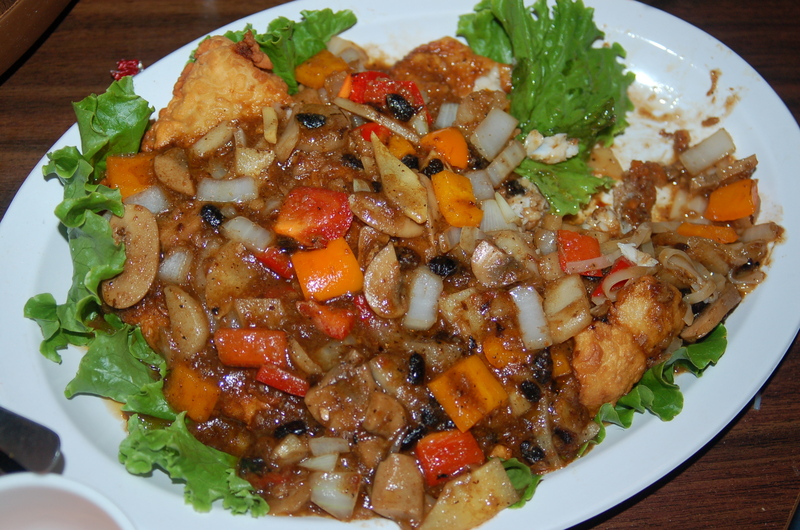 ), but I was pleaded and begged for the ginger chicken! I wanted to slow cook it, but now I had to think of a more efficient method. I decided to sear the meat which would give me a head start, and use a heavy casserole which would intensify the heat inside the pot. 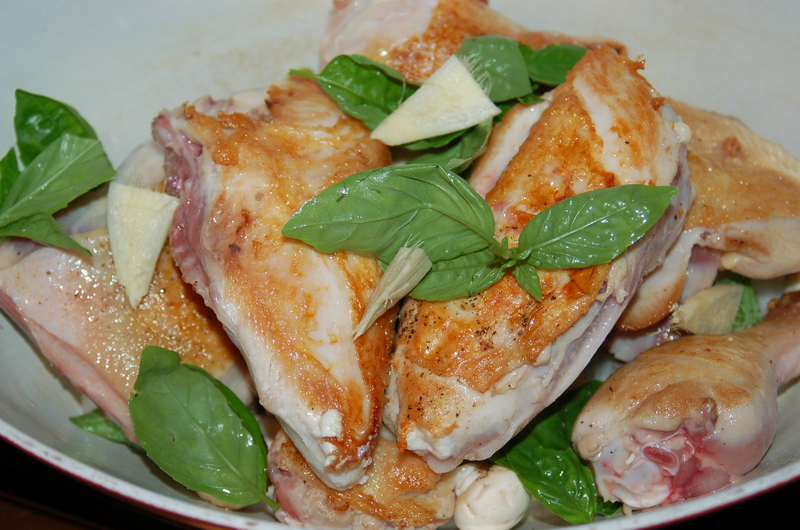 I love using as little ingredients as I can when it come to cooking chicken in the summertime. 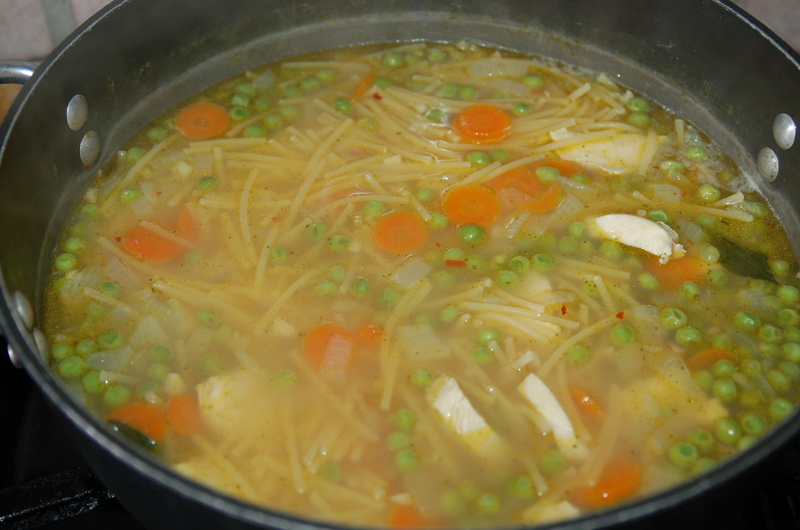 I decided to blanket the chicken in big slices of onions, and use fresh basil leaves for sweetness, (as well as it adding a shock of color to go with the milky white complexion of the ginger broth). 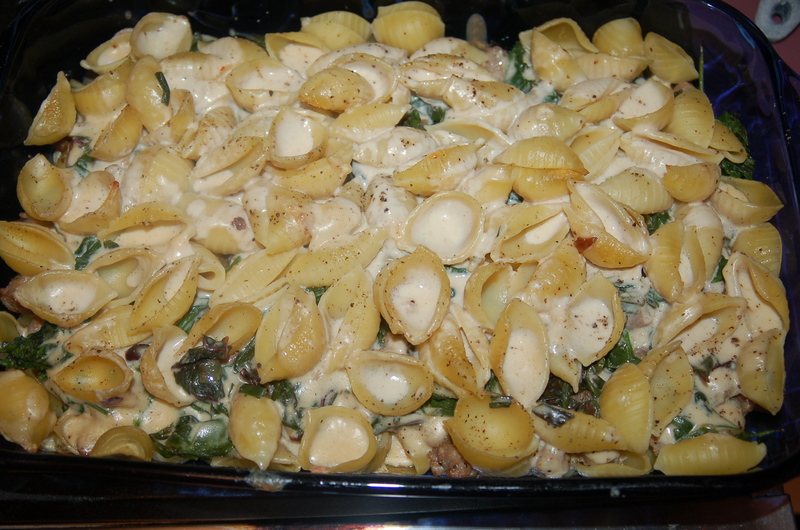 I had tiny button mushrooms, and they were the perfect last addition to this dish. If you want to cook something impressively elegant and fresh with practically little effort, then this is the dinner you should cook this week. 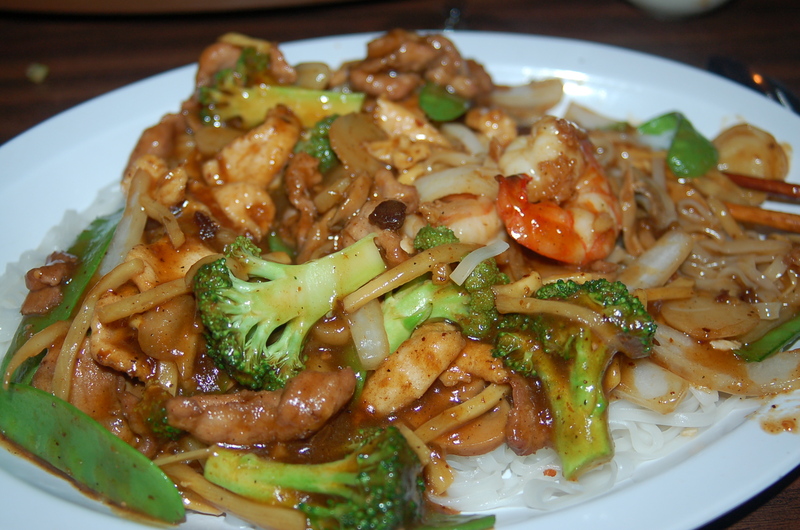 You will not be disappointed with the flavors, and the succulent tender meat. Throw it on the minute you get in the door and enjoy an hour chatting with the family while dinner cooks itself! You will need: 1 chicken cut into 8 pieces (about 3 1/2-4lbs), 3 tbs olive oil, 2 cups baby mushrooms, left whole, 2 medium sweet onions. sliced whole into rounds, 14 basil leaves, left whole, 1″ piece of ginger root, peeled & quartered, 1 tbs minced fresh ginger root, (use the finest side of your grater or a zester), 1 cup white wine, (can be on the sweet side, like a Riesling or sweet-style chardonnay), 1 1/2 cups water, coarse sea salt (I use Maldon), freshly ground black pepper, 6 cups cooked basmati rice (2 1/2 cups raw for stove-top method & 3 cups using rice cup for rice cooker). 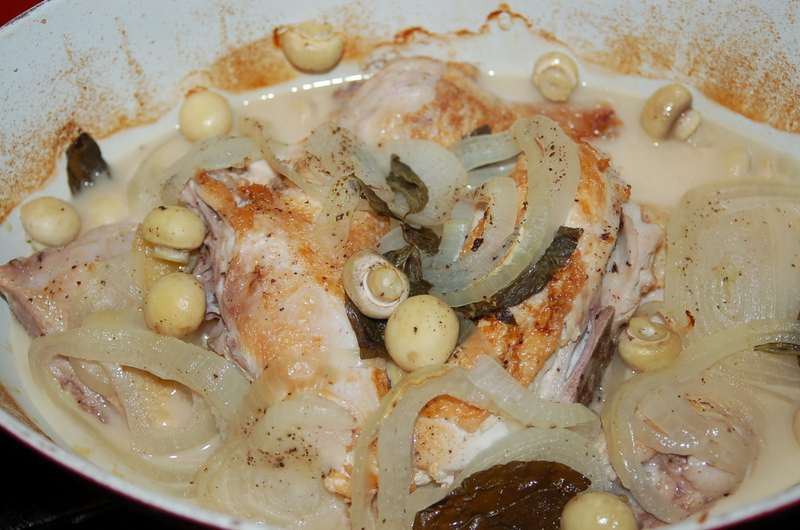 1 – Season chicken with salt and pepper. 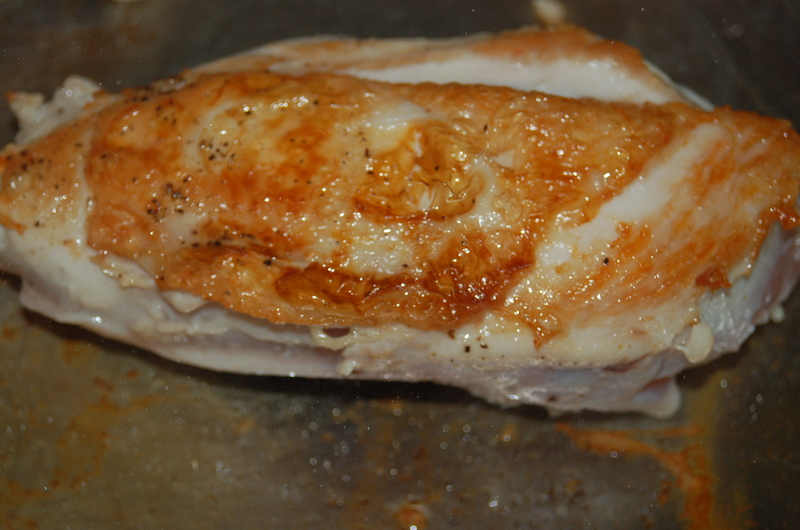 Put pan on high heat, add 2 tbs of oil and sear chicken in batches until browned (about 2 minutes per side. You may need to add more oil for second batch). Don’t try to do this in 1 step or the meat will not brown fast and crisply. Transfer to plate and set aside. 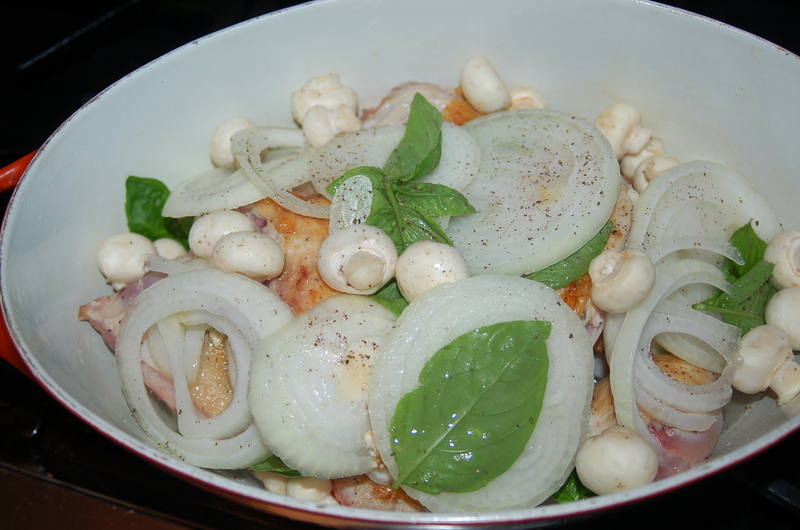 2 – In a heavy casserole or dutch oven (which has a lid) line the bottom with 1 onion, followed by 1/2 of the basil and 1 cup of mushrooms and 2 pieces of the ginger quarters. Sprinkle about 1/2 tsp coarse salt and several grinds of pepper over everything. 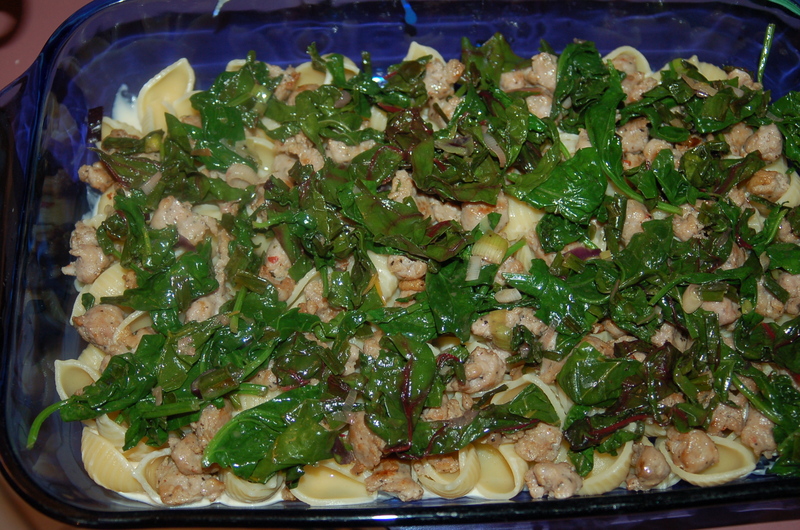 3 – Next, add the chicken in an even layer, followed by most of the basil and the last 2 pieces of ginger. 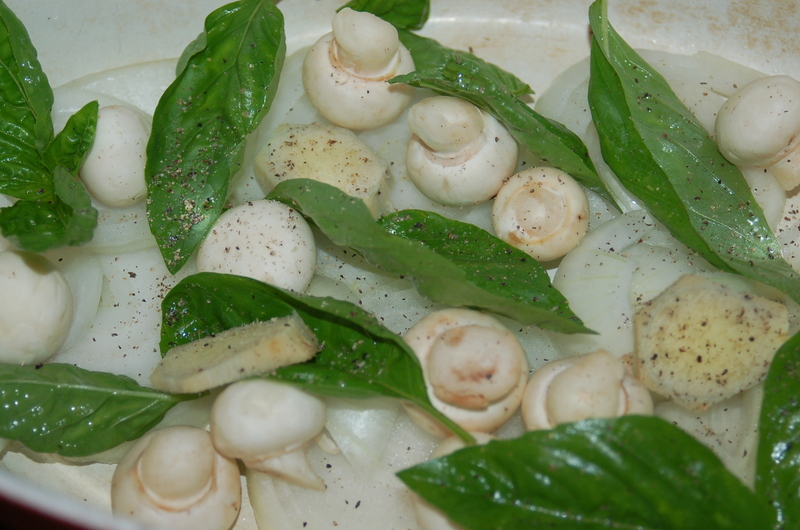 4 – Top with a last layer of onion rounds, 1 cup mushrooms and a few basil leaves. 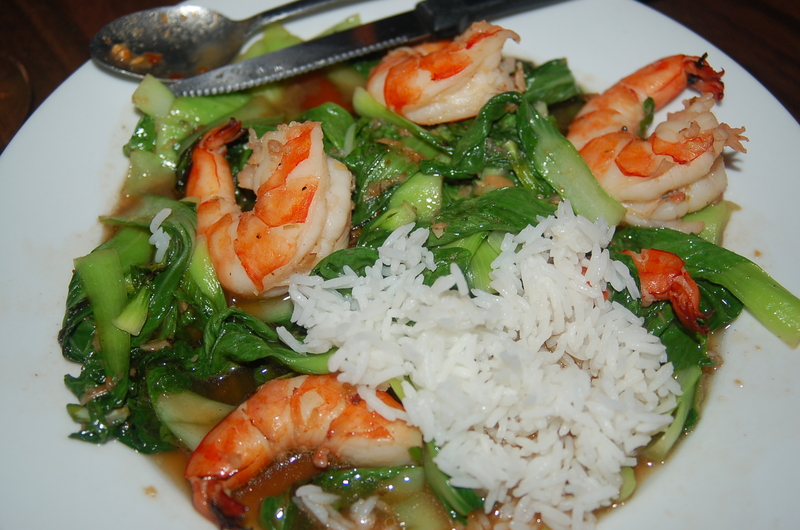 Combine the minced ginger with the water and wine in a small bowl with a fork, and pour into the casserole. Add a few grinds of pepper, cover and place in oven for about 65 minutes. Remove from oven and let the dish sit for about 10 minutes before serving with rice in warm shallow bowls. 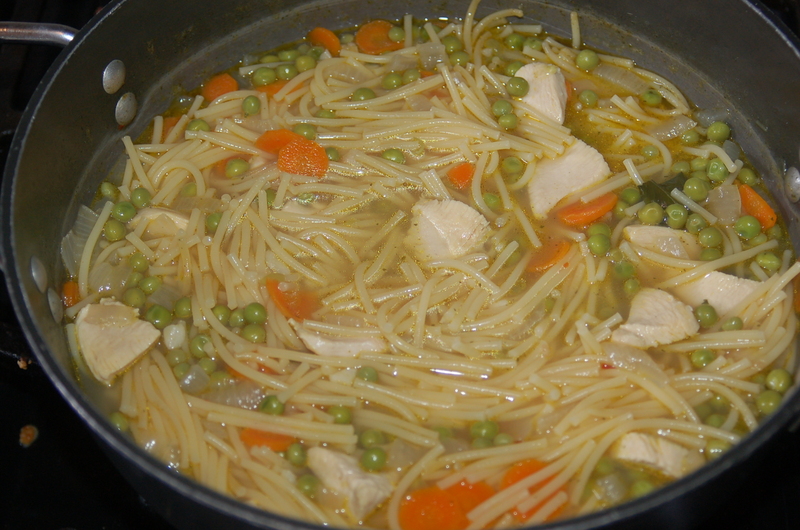 To serve: Put a cup of rice in bottom of bowl, top with chicken and vegetables, and add lots of gingery broth. Last night I wanted to use a big portion of my greens from my CSA box from Good Work Farm (see top right of my blog for more information). I was craving greens, and, if it were totally up to me, I would have been very happy to simply saute them in some extra-virgin olive oil and garlic, and eat them with a poached egg and a slice of good bread. 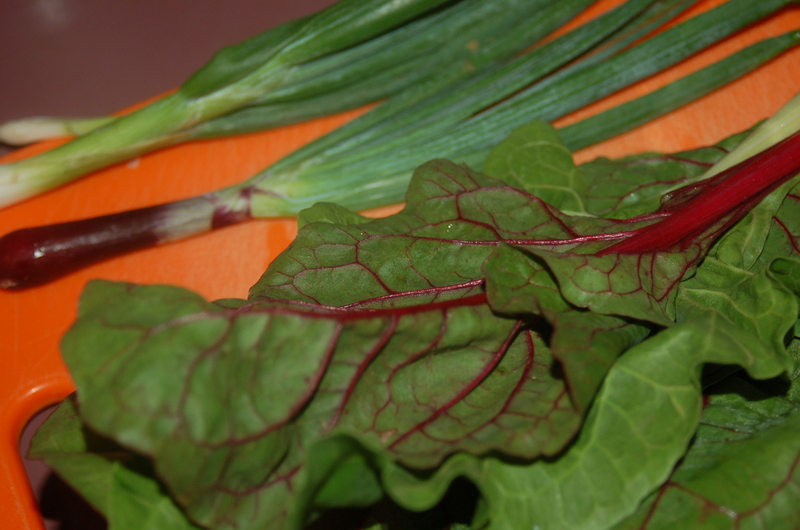 Bunching Onions and Red Chard from my CSA box this week.. However, I live with people who also have a say in what we have for dinner. It is true that in the kitchen, I rule, and although sometimes I make exactly what I please, I generally concede when I am begged to do otherwise, or at least compromise. I suppose last night’s dinner could be called the greatest compromise. 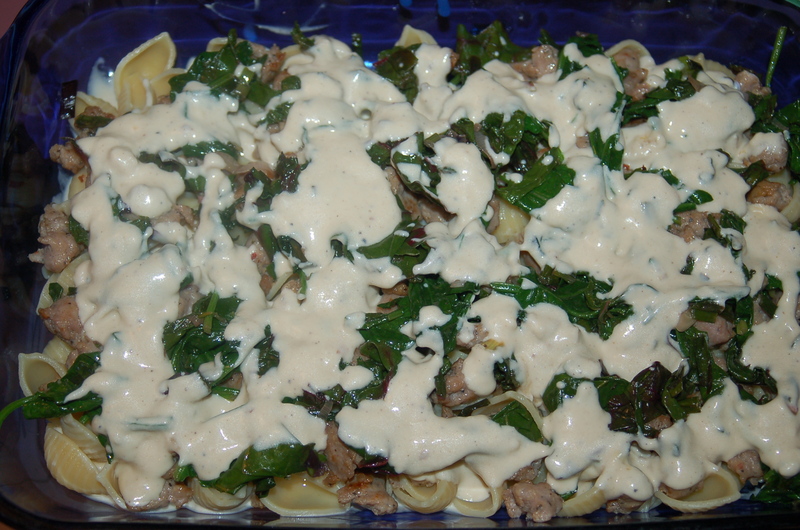 I loved the taste of the greens with the strong cheese, and, as I looked about me I felt I had satisfied everyone’s particular need for a certain craving. I also made enough for an army, so we had better be content to have the same thing for lunch today. 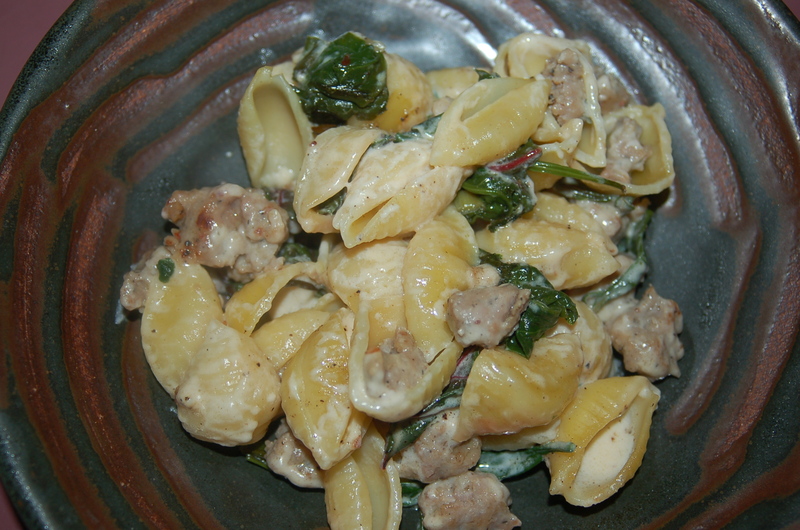 You will Need: 2 – 3 tbs extra-virgin olive oil, 1 lb seasoned sausage (your choice; sweet Italian or any herb or garlic infused variety), casing removed and torn into bite-sized bits, 3 bunching onions or 4 scallions, white and green parts, sliced, 1 bunch red chard (6-8 leaves), center rib removed and roughly chopped, 1 big bunch fresh spinach (6 cups approx), washed, 3 tbs unsalted butter, 3 tbs all-purpose flour, 3 cups milk (any %), 1 cup Parmigiano Reggiano cheese, grated, 1 lb pasta shells (I used large shells by Barilla), coarse salt (I used Maldon), freshly ground black pepper. Put big pot of water on to boil for pasta shells. cook according to instructions. when cooked, drain, and rinse with cold water. Leave to drain until ready to assemble dish. 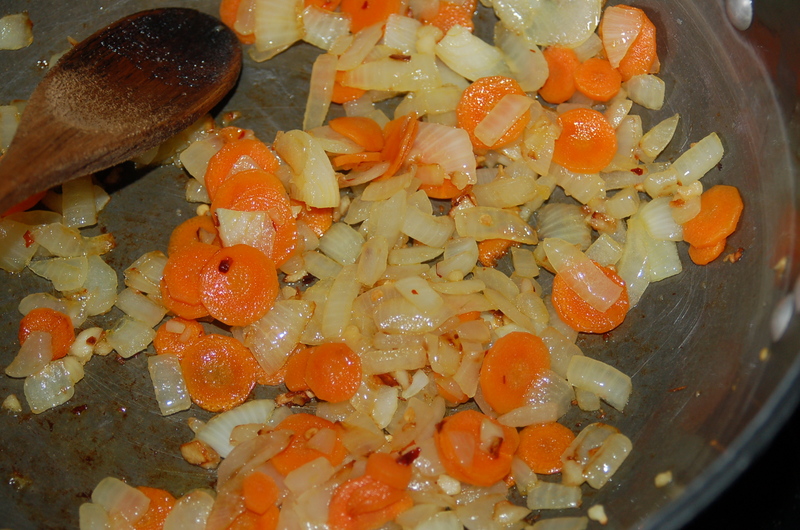 1 – In the meantime, put saute pan (at least 12″) on low/medium heat and add 2 tbs of oil. 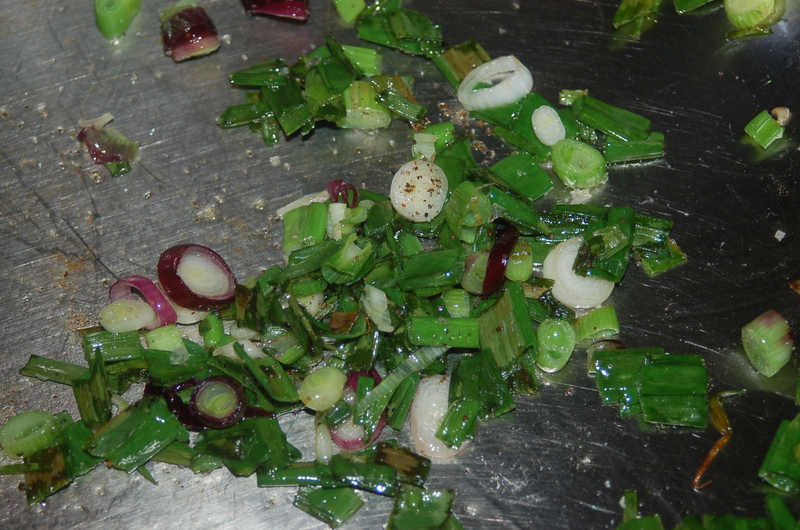 Add onions or scallions and cook for 7 minutes. 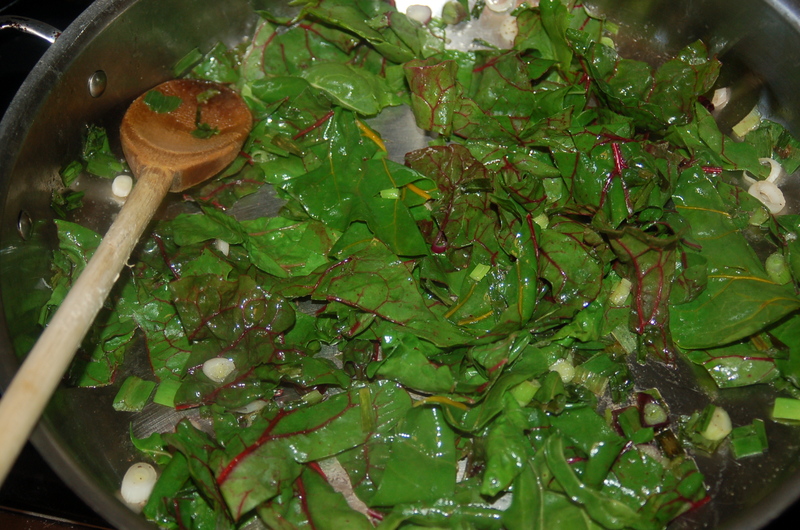 2 – Turn heat up to medium and add red chard. Continue to cook for another 5 minutes. Add spinach and cook for another 3 minutes. 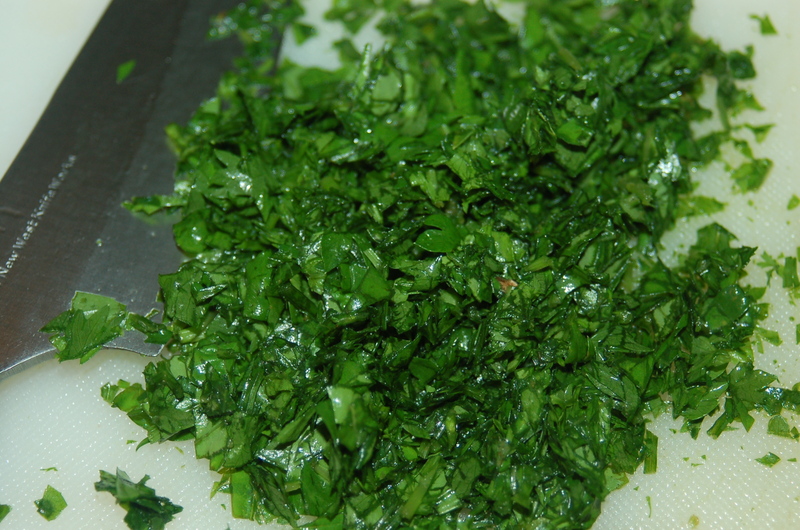 Remove all greens to a plate and set aside. 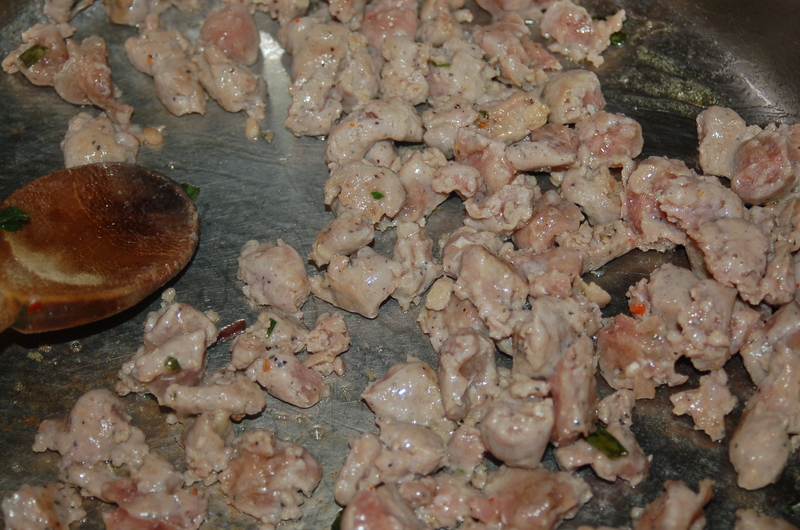 3 – Add last tbs of oil and add sausage. Saute until it has cooked; about 10 minutes. Remove from pan and set aside. 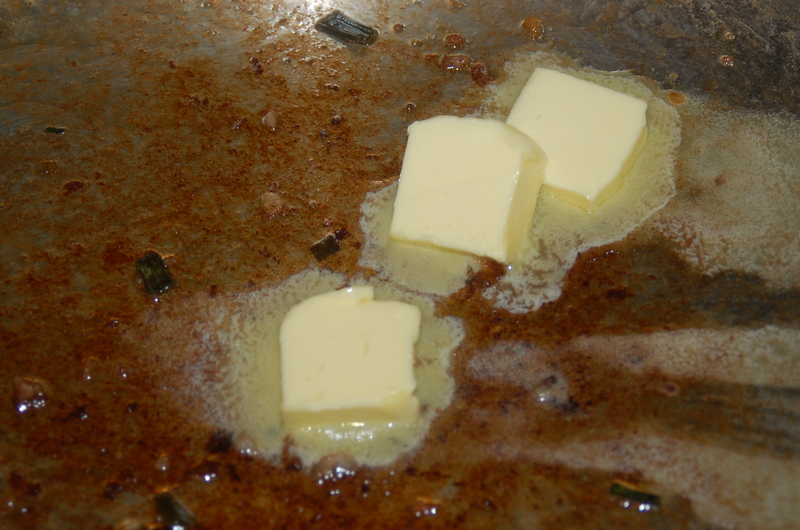 4 – Turn heat down and add the butter. 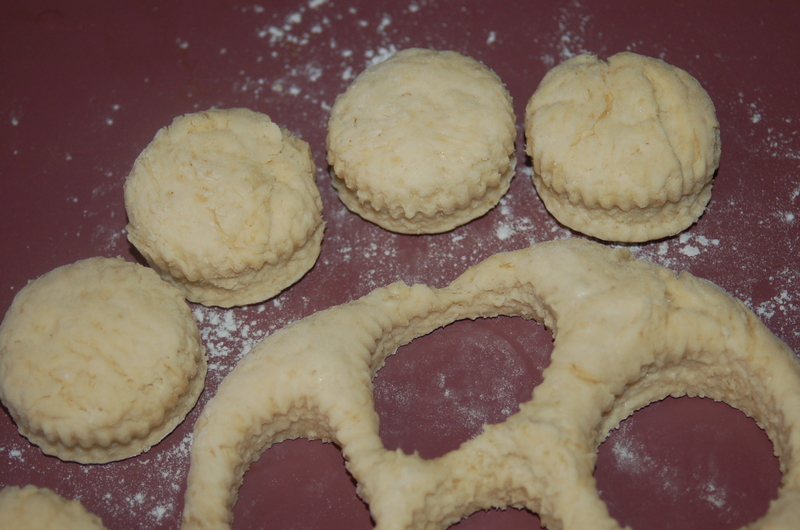 When it has melted, add the flour and whisk quickly until you have a smooth paste. Add the milk one cup ar a time and stir until the liquid is smooth. 5 – Turn heat to medium and cook the sauce for about 10 minutes. 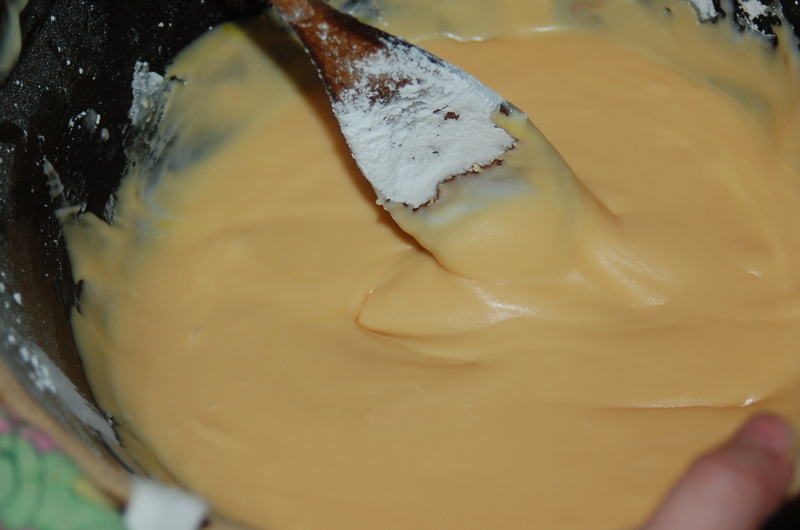 Take off of heat and stir in the cheese. 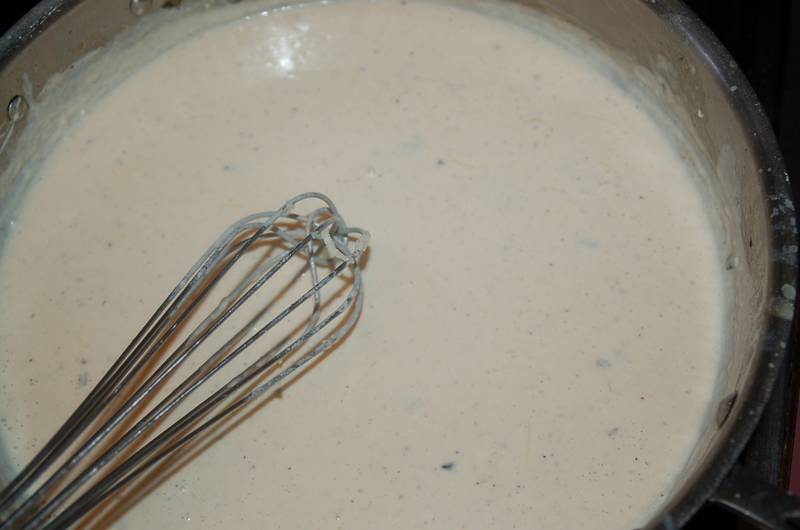 Taste sauce for addition of salt and pepper. 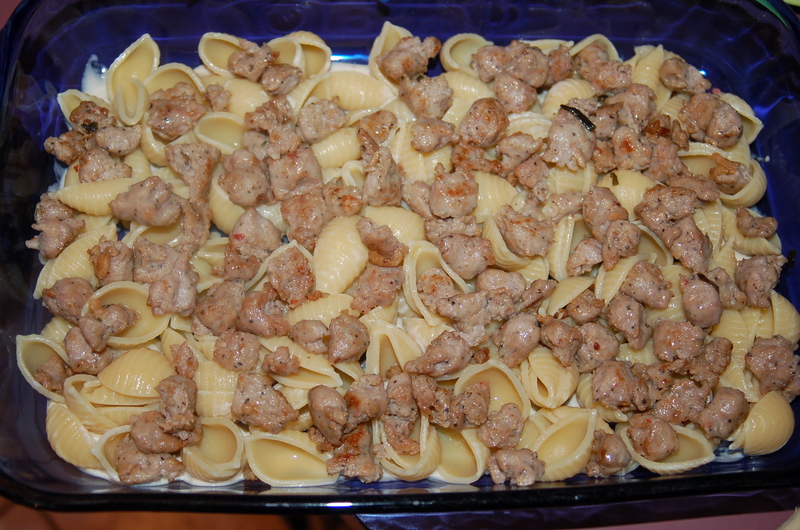 Top with the remainder of the shells and spread the last of the sauce, followed by several grinds of black pepper. Cover with foil and bake for 35-40 minutes. 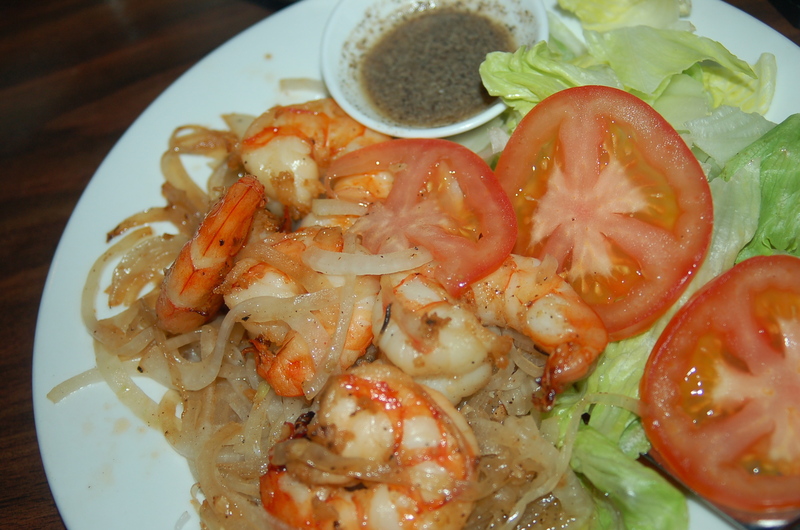 Take out and let it sit for 5 minutes before serving. I went out to dinner with friends last night (I know, it’s a miracle!) and this morning I felt like having a real weekend breakfast; that meant something which is more of a treat that something that would keep me going all day! I was even debating on having a piece of the chocolate cake I made a couple of days ago with my daughter, (type Chocolate Cake in my search box to the right for recipe). It wasn’t the guilt that stopped me, it was spotting the raspberry jam sitting side by side with a carton of heavy cream which diverted me! I love scones. In fact, when I started this blog, it was my very first post. 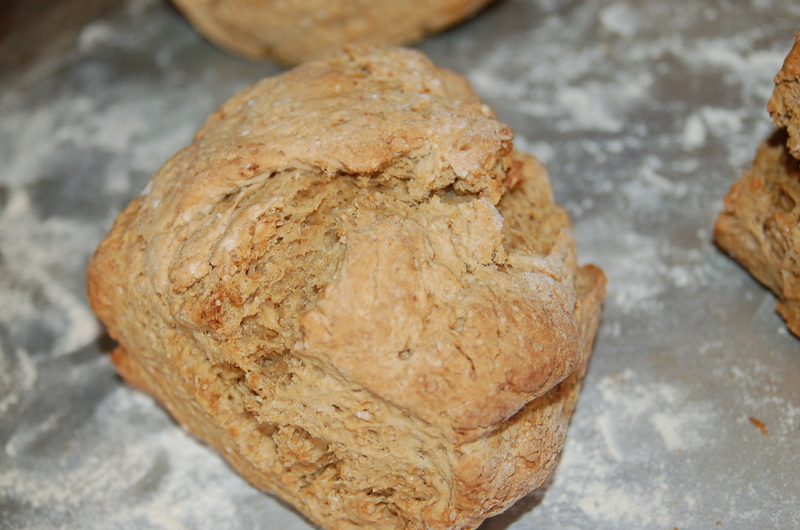 It reminds me of so many great things from my past; my lovely mother, who could throw a batch of scones, or a loaf of soda bread together with one arm tied behind her back and her eyes closed. She never measured a thing, just dumped the flour onto the table and added whatever else on her whim. She made the most incredible soda bread dotted with little currants. We had dinner at 1pm every day, and tea at about 6 o’ clock in the evening. Tea could be anything from a ham sandwich to bread and jam. The best day was when we would pile in for tea (all 6 kids!) and on the middle of the table would be a plate, piled high with her currant bread, butter still melting from the warmth of the dough – absolute Yum! We couldn’t eat it fast enough, all washed down with big strong cups of milky tea. Try as I might, I am incapable of replicating it. I should stop measuring, close my eyes and think of her deft floury hands. It is because of the years of watching her bake bread and scones in this fashion that I make scones to this day without using a recipe. I make countless subtle variations depending on what I am using them for, and what ingredients I have on hand. If I don’t have buttermilk, I use milk and baking powder (instead of baking soda with the buttermilk). I’ve even resorted to diluted sour cream if I don’t have enough milk. I’ve made them with butter, with butter and eggs, cheese, bacon bits, lots of black pepper, on and on. 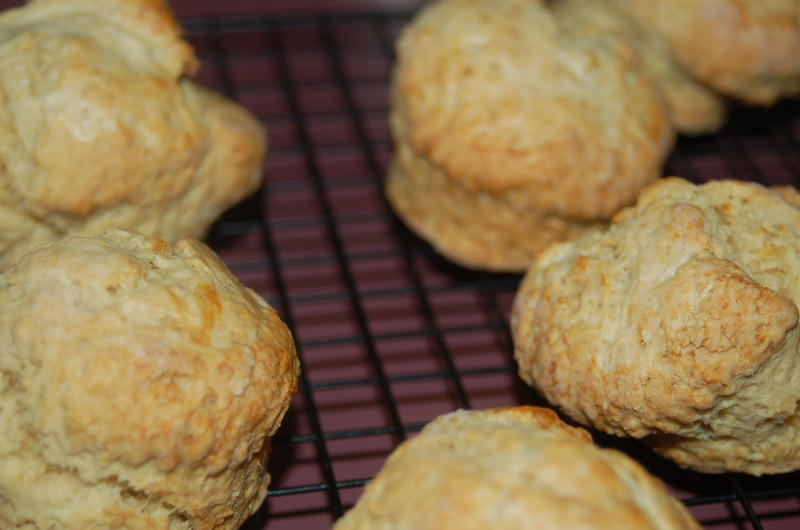 This morning I wanted sweet and creamy scones, so I added an egg and some sugar to make it richer. I had it with cream and raspberry jam, and, you certainly could serve it for dessert like this. My kids had it with bacon. It is also good topped with a fried egg. It is such a simple thing to make, however, the accolades your receive are enormous if you present fresh warm scones to the people you love, first thing in the morning! You will need: 2 cups all-purpose flour (I use King Arthur brand), 1 tsp baking soda, 1/2 tsp salt, 2 tbs sugar (I use Raw Brown sugar), 4 tbs (4oz) cold unsalted butter, 1 egg, 3/4 cup buttermilk. raspberry jam, freshly whipped cream. 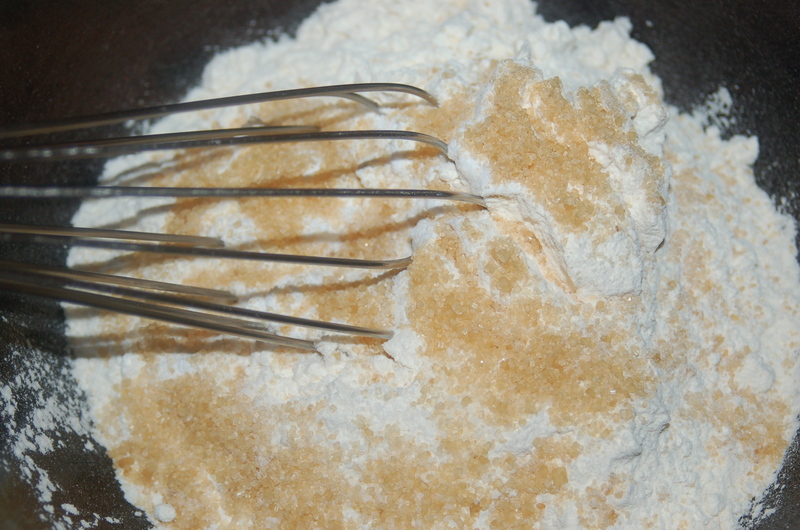 1 – In big bowl whisk together the dry ingredients. 2 – Add the butter in thin slices and work it into the flour with your fingertips until the mixture resembles a fine meal. 3 – Combine the egg and buttermilk with a fork. Make a well in the flour and add. Mix together until it binds into a solid piece with a wooden spoon. Don’t over-mix. 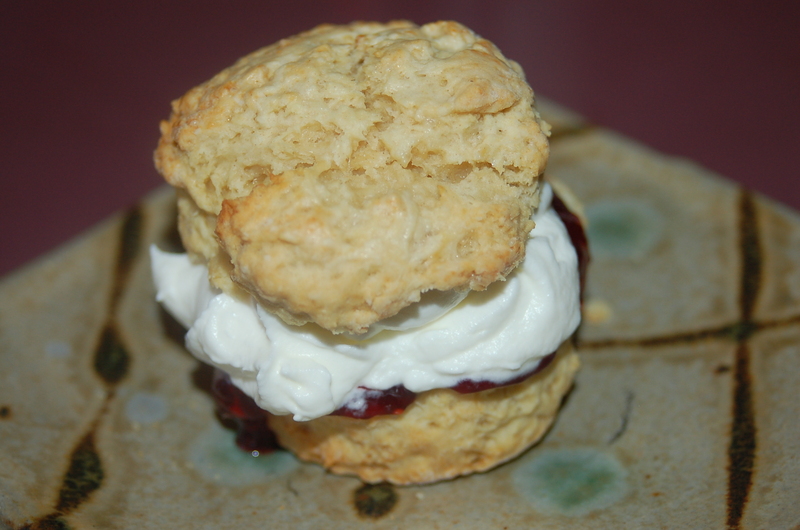 5 – Cool on a wire rack until warm (about 5 minutes) Whip some fresh cream until nice and thick, split scone and lavishly spread some jam on bottom half and top with lots of cream. Put top on and it’s ready to eat! 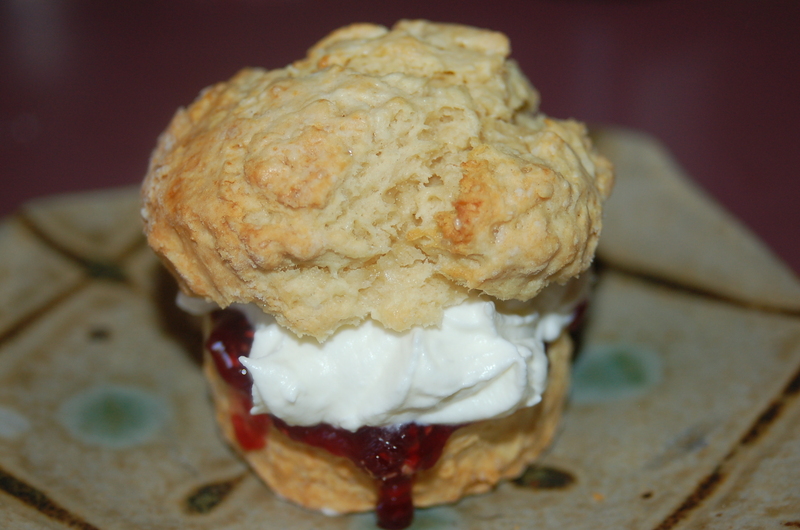 Nothing better than a warm scone with a decadent filling! 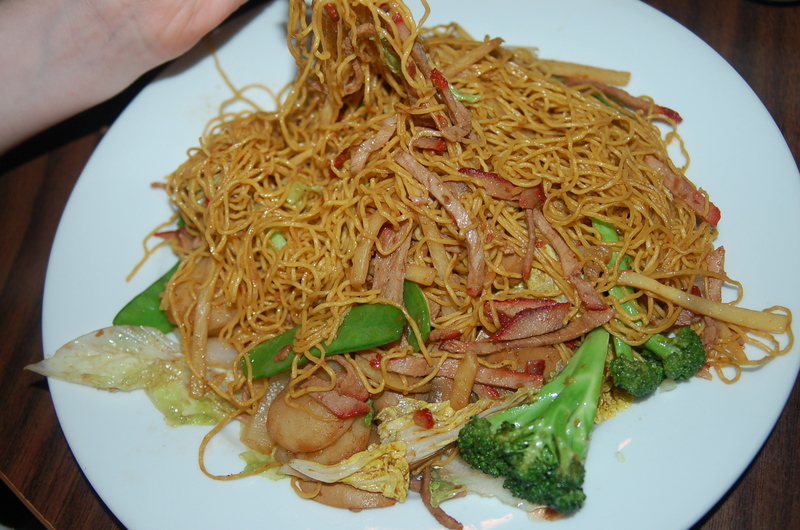 Here is a fun pictorial of what we had for dinner while out last night! Lavender Ice cream - this was completely amazing. It reeked of lovely, perfumy lavender flowers. I have to make this! 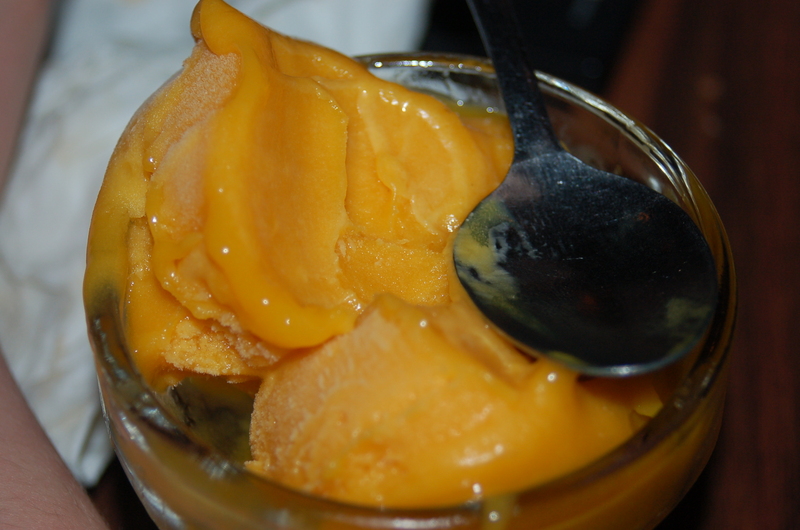 Mango Sorbet - a lovely ending to an evening with friends. 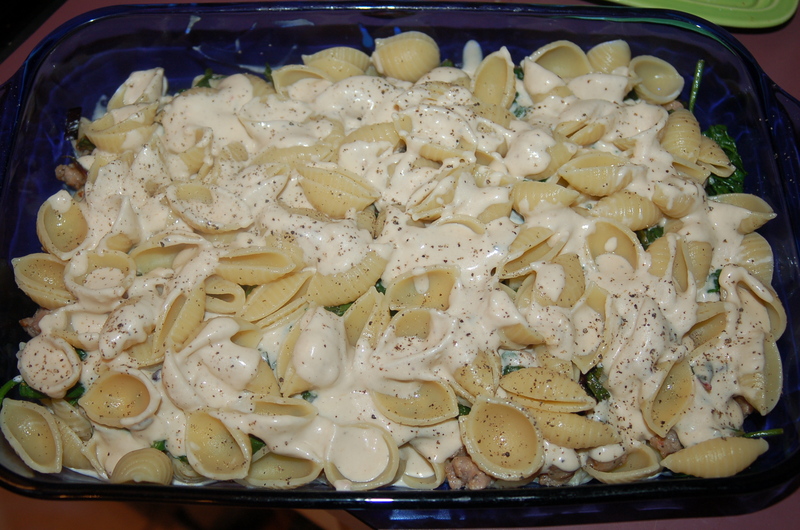 This recipe just had to be posted, and blogged about! 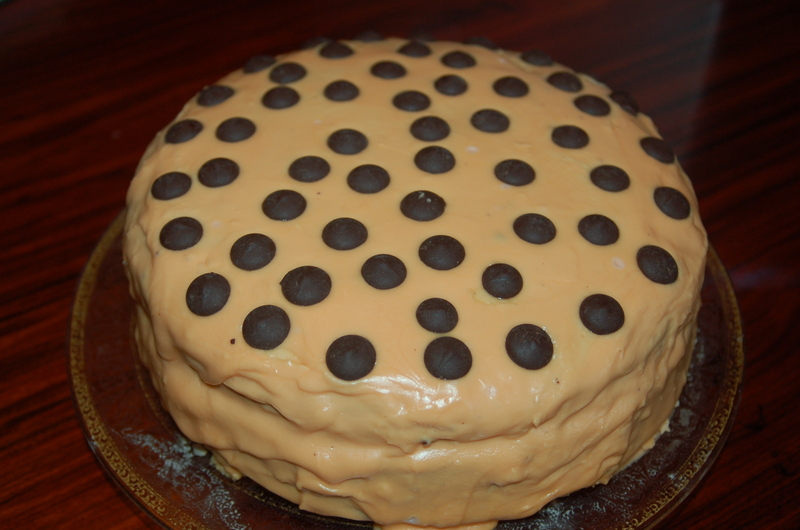 My blog is about what I pull together for dinner, but I have to make a special exception in this case of this cake. I am not much of an ad-libber when it comes to baked goods (save for a simple bread dough , scones and maybe muffins). Being a baker is like being a chemist, you need to know how ingredients are going to react together under the pressure of heat, or by the sheer act of mixing them in a bowl! I love to make cakes when there is an occasion or just so myself and my daughter or son can do something fun together (and then get to eat the fun!). 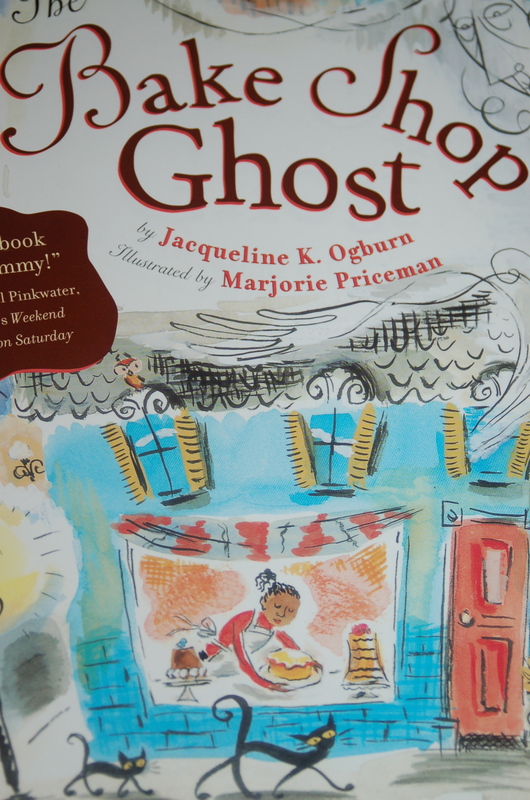 I have been reading this book, The Bake Shop Ghost (by Jacqueline K. Ogburn, and Illustrated by Marjorie Priceman) to my kids for years. The best kids book about yummy confections ever! The story is about a wonderful, but sour-pussed baker named Cora-Lee, who makes wonderful cakes and pastries. She dies and leaves the town completely forlorn. Who will bake for them now? Each potential tenant however is haunted out of the shop by Cora-Lee, until one day she meets her match in the spunky and talented Annie Washington. I won’t spoil the ending, but I will say that it makes me feel happy and choked up every time I read it. There are long lists of cakes in the book that make me salivate, and long for just 1 perfect slice of cake; like….”fluffy meringue pies, glistening fruit tarts, flaky strudels, layer cakes, sheet cakes, cakes with glazes, cakes with fillings, cakes with frosting finer than Irish lace, chocolate cakes, white cakes, tiny petits fours and towering wedding cakes” – When you read the words slowly it is hard to keep from slamming the book shut and dashing out to the bakery! My daughter iced and decorated this chocolate wonder. 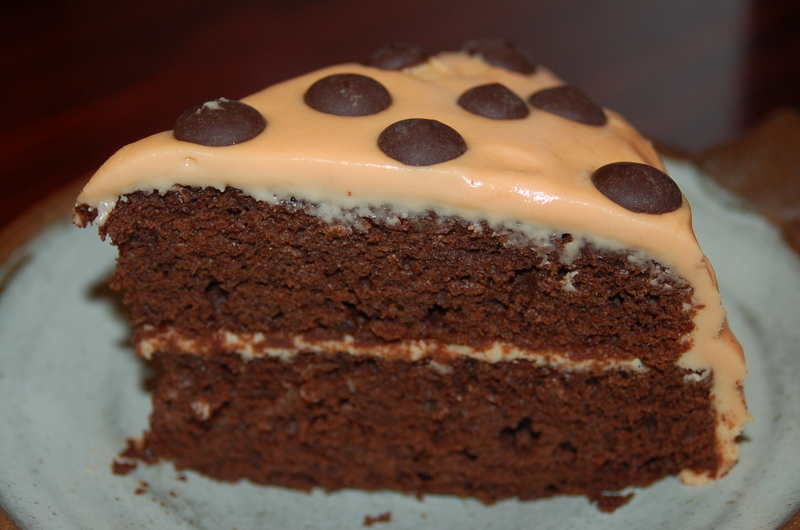 There is a cake recipe at the very end of the book for a luscious chocolate cake with frosting (adapted by Luli Gray from a recipe published in Cook’s Illustrated magazine), and, each time we read the book we vow to make the cake; we never have. The book got put into the box of books that the kids have more or less outgrown but we still want to keep, until the other day, when my daughter mentioned the book, and the cake we never made. That was it! With a little rummaging in the nether regions of the attic room we found the book. My daughter read it out loud and we began dreaming about that chocolate cake again. Well, we finally made it – yeah! 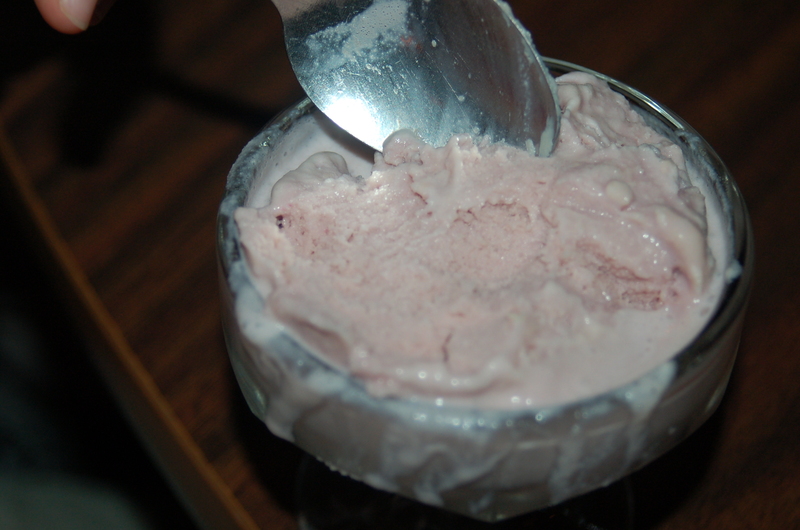 When we tasted it, we closed our eyes and began to mmmm. It was rich, and buttery, and chocolate-y, and not overly sweet. I changed 1 thing in the recipe. Instead of the 1 cup of water called for, I used 1 cup of brewed coffee leftover from breakfast. I love coffee and chocolate, but feel free to go with just water. 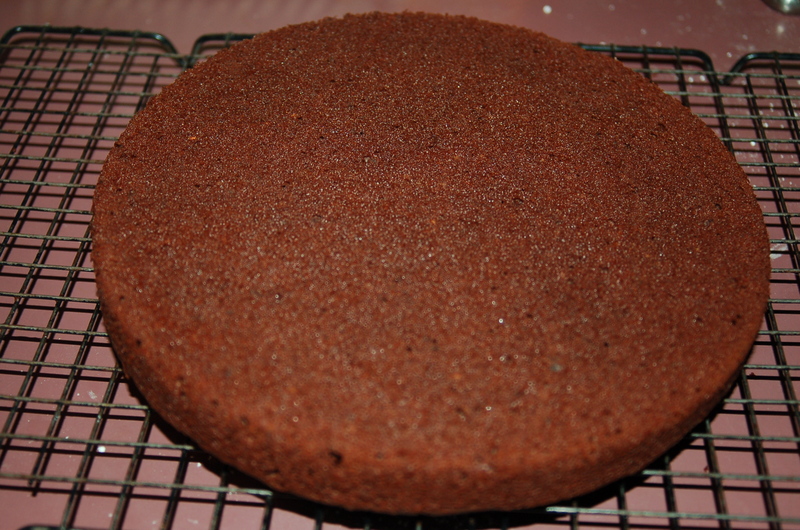 I also doubled the frosting, as the amount called for was not enough to fill and frost the cake completely. Oh and we also colored it, just for fun. And, if you get a chance, buy the book or get it from the library, and eat a slice of this cake right after you finish reading. In a large bowl, mix together: 1 1/2 cups sugar, 1 1/4 cups all-purpose flour, 3/4 cup unsweetened cocoa powder, 4 tbs buttermilk powder (found in the dried and evaporated milk section of your supermarket), 1/2 tsp baking soda, 1/4 tsp salt. Prepare 2 9″ or 8″ cake pans by buttering the sides and bottom and then laying a circle of parchment or wax paper on the bottom and buttering it. 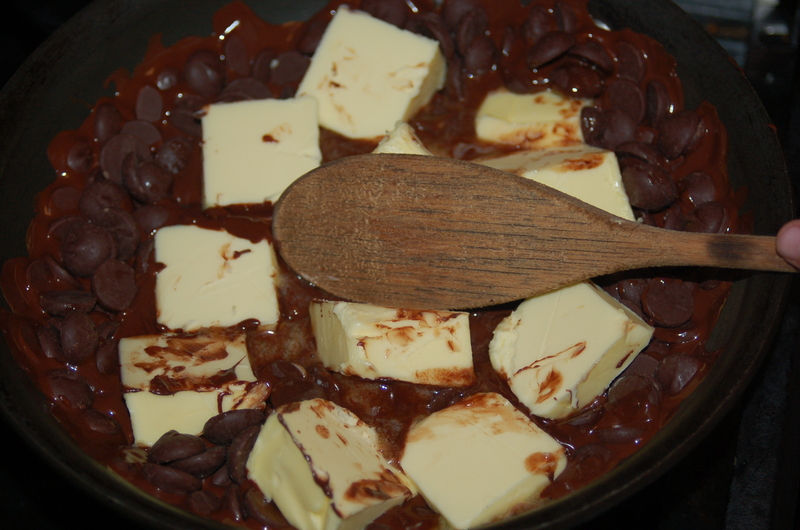 In a medium saucepan, melt over low heat: 1 1/2 sticks of unsalted butter (12 oz) & 8 oz bittersweet or semi-sweet chocolate. In medium bowl, beat: 4 eggs with 1 cup of water (or cold coffee) and 1 tsp vanilla. Scrape melted chocolate and butter into bowl and combine. Mix wet ingredients with dry ingredients.. 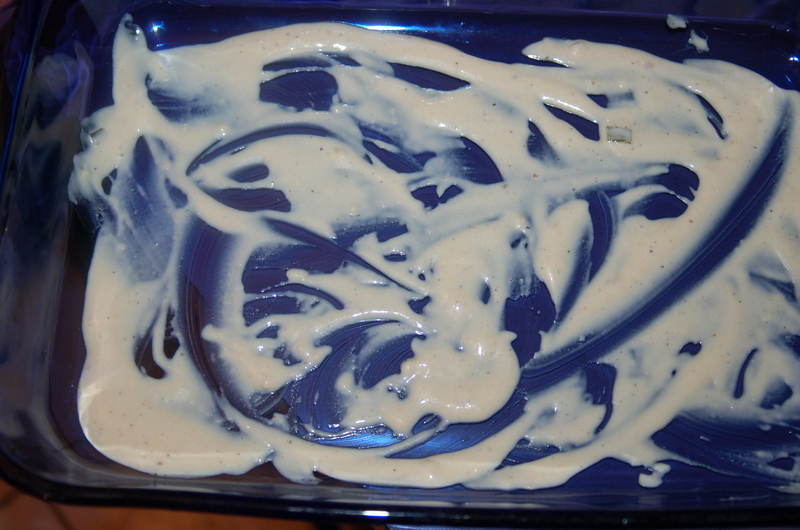 Mix the wet ingredients into the dry ingredients until just blended. Pour into prepared cake pans and bake for about 35 minutes or until a toothpick inserted into the middle of the cake comes out with moist crumbs clinging to it. Cool on rack completely before frosting cake..
you will need: 6 cup confectioners sugar, sifted, 2/3 cups soft unsalted butter, 1/2 cup water, 2 tsp vanilla extract, pinch of salt. Combine all ingredients in large bowl and beat until smooth. Add coloring of your choosing if you like. Add more sugar for a stiffer frosting. Is there anything about chocolate not to love!